Mormon Moms: Why do Mormons Prepare? A few months ago I received an inquiry from a sincere woman - whose husband was curious to know 'Why Mormons Prepare'. I was happy to respond to her request for information - and send her my personal views as well as a few links to church information and Prophetic statements. From an early age I was taught to prepare. I remember a specific Family Home Evening where we went down into our family food storage room and took and inventory of what we had and what we needed in order to have a, then recommended, two-year supply of food and supplies. For many years I have attended classes, read books, and sought diligently to know more about what I could do to be self-reliant and to prepare myself both spiritually and temporally for any calamities or set-backs that might happen. On the right side of this blog - and down a little bit on the page - I have posted several books that I highly recommend for any who really want to know and do more - so as to have peace of mind on this mortal journey. I will also attach below - several sites that I've done over the years (not as fully as I would have liked) with powerful messages from the brethren (LDS church leaders) concerning the day in which we live and the importance of heeding WISE Prophetic Counsel. I'm a single parent on a very limited budget. If I can prepare - then anyone can. I've had miracles as I've put my trust in the Lord to help me prepare. 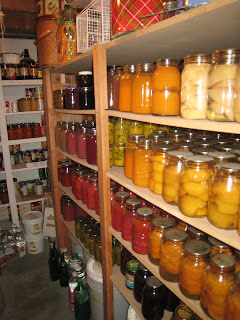 Out of the blue I've had people offer me apples and apricots during canning season (which were a God-send) as well freezer meat when neighbors were moving, potatoes from a friend whose father worked at a dried potato-canning facility, as well as other commodities when needed. This has often brought me to tears, in gratitude of the Lord's goodness and His willingness to help me and my children - as we've sought to prepare as best as we could. I know that as we truly seek to obey this commandment - the Lord will partner with us - IF we ask for His help and are humble. He wants us to succeed and ....he wants to feed us. But, we have to be willing to obey all the counsel that we've been given. We invite you all to join our NEW Facebook Group 'All About Preparedness' and SHARE your BEST information and ideas!